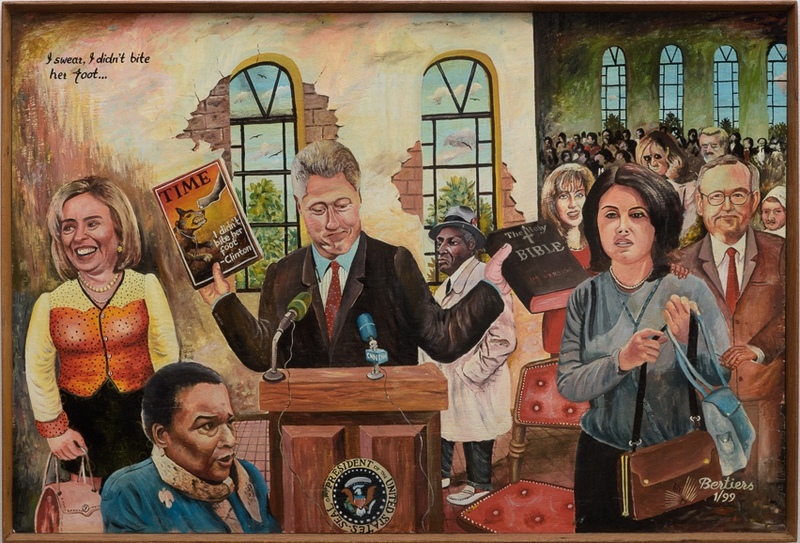 For more than two decades, Joseph Bertiers of Kenya has created humorous yet sophisticated message and political commentary paintings about events world- wide. Although he has never left his Kenyan homeland, Bertiers often chronicles events which would seem, at first glance, to be unrelated to his life experience. However, always an avid reader and connoisseur of the local Kenyan press, he now enjoys both access to and information from the world press. Time, Newsweek, The Economist, The Guardian, as well as CNN and the local Kenyan newspapers, have become the fertile grounds from which his largely imagination based paintings are derived. His subject matter ranges from A to Z -- from AIDS to Zimbabwe. His realistic and colorful paintings are rendered on plywood and embellished with English text. Bertiers is married and the father of three children. As an artist, he is entirely self-taught, and has had minimal exposure to art from outside Africa. He is a member of the Kikuyu tribe known throughout Kenya as merchants. At the age of 18, he began his artistic career, painting signs for local bars, butchers and beauty parlors. He showed his inventiveness early on, creating a character called “Mr. No Credit”, designed to discourage customers from asking for free services. Modest commercial success aside, Bertiers grew frustrated by the limitations for creative expression, which he depicted in a series of humorous paintings titled “Painting A Cat -- I Really Hate It”, self-portraits of the artist brushing paint on live cats, suggesting that only cat painting could be a worse job than sign painting. Finally, Bertiers’ chance to change directions came when American collector Ernie Wolfe saw Bertiers’ early work in a bar outside Nairobi. Wolfe was so intrigued by its forthright charm he sought out the artist and became his patron. At this point, Bertiers was able to turn his artistic attention to the subjects he now paints with such humanity -- fools and dreamers, heroes and charlatans, domestic bliss and marital discord, personal foibles and national tragedies -- taking us all to task mostly with gentle humor, and always with the assurance that he shares the same problems with the rest of us. He very well may be bridging the gap between naive and “third world” art and world art of the 1990’s. Joseph Bertiers was born in 1965, Nairobi, Kenya.